The Moscow Mayor's Office published a booklet for migrant workers that it hopes will help Muscovites and migrants better understand each other. Some critics, however, find the booklet politically incorrect and unjustifiably expensive. City officials insist, however, that it is better than nothing. "It contains rules of conduct and laws that must be known and followed!" a girl in a red traditional Russian headdress and a thick braid tells the migrants arriving in Moscow. 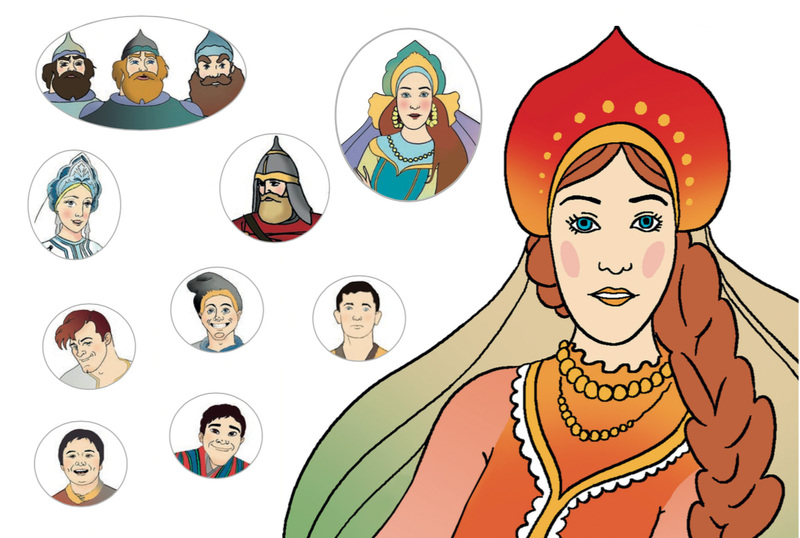 Vasilisa Premudraya, a heroine from ancient Russian folktales, is now also the name of a 100-page brochure subtitled, "On the migrant's rules of conduct in Moscow." Together with other fairytale characters, such as the Snow Maiden and the Three Knights, Vasilisa teaches migrant workers how to behave in Russia's capital. The brochure was commissioned by the Moscow Mayor's Office and developed by an NGO, Support for Moscow's Working Migrants, at a cost of 7.3 million rubles ($122,957). The brochure is in the form of an instructive comic book in which fairytale characters speak with abstract heroes symbolizing migrants. "Foreign citizens come to Moscow, and we believe they are also fantastic heroes and they are welcomed by fantastic heroes from Russia," explained Alexander Kalinin, director of Support for Moscow's Working Migrants. Originally, the migrant characters were supposed to correspond to various nationalities, but then the idea was changed in order to avoid charges of racism. The fairytale heroes work closely with the migrants. They explain that one cannot speak loudly on Moscow streets or harass women with eyeballing. They also test the migrants' knowledge of the Russian language, explain the rules of filing documents, and show them famous sights. The Three Knights have the Ministry of Interior sign on their chests and say that when policemen check passports on the street they are not accusing anyone of anything, and this request should not be considered demeaning. There is also a villain named Koschei the Immortal, a horrific old man with a gray face. He tries to persuade the newcomers to work in the Moscow Region, although their permit allows them to work only in Moscow. The migrants should not do this, warns the brochure. Some social network users were perplexed by the new brochure. The main complaint is that Moscow is represented as a kingdom of ethnic Russians where non-Russian migrants come to work. "What is the mayor's office trying to achieve - stir up nationalism?" wrote Sergey Tsvetkov on his Facebook page, adding that among the migrants are many ethnic Russians from former Soviet republics. "It is clear that resistance by Russian heroes to the invading hordes is being revived," said Evgeny Varshaver, director of the Center for Migrant Study and Ethnicity, during an interview with BBC’s Russian service. He also noted that the brochure’s content is rather ambiguous. For example, it says that one cannot eat on the street in Moscow. "For me this is news and I'm a third generation Muscovite," said Varshaver. Other social network users believe the brochure was too costly. "Seriously? 7 million for a comic book," said Alyona Neterebskaya. Nevertheless, Evgeny Varshaver remarked that, "Any brochure is better than no brochure." Vyacheslav Postavnin, president of the Migration: XXI Century Foundation, agrees with Varshaver. Previously, Moscow city authorities did not even try explaining to migrants how to live in the city. Therefore, the appearance of even an imperfect brochure is a small step forward. Concerning the controversial parts, Postavnin believes they are the result of the authors' rash desire to have their work appreciated not only by migrants but also by Russian society and the authorities. Therefore, we see policemen portrayed as knights. "Our society is rather condescending towards migrants," Postavnin admitted. "And this was reflected in the brochure." However, he is convinced that the authors did not have any bad intentions and the brochure’s usefulness is greater than its drawbacks.